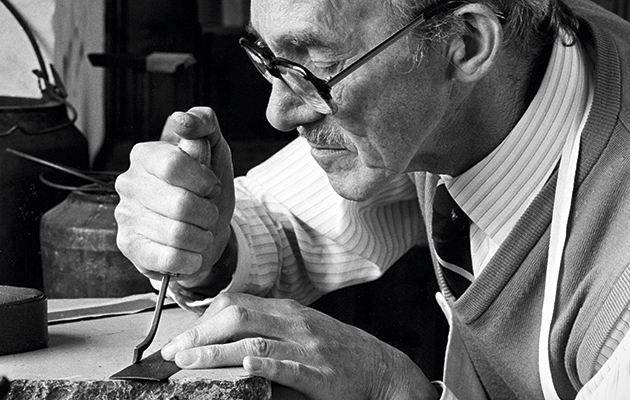 Walsall has a tradition of saddle-making and leatherwork that remains alive and well. 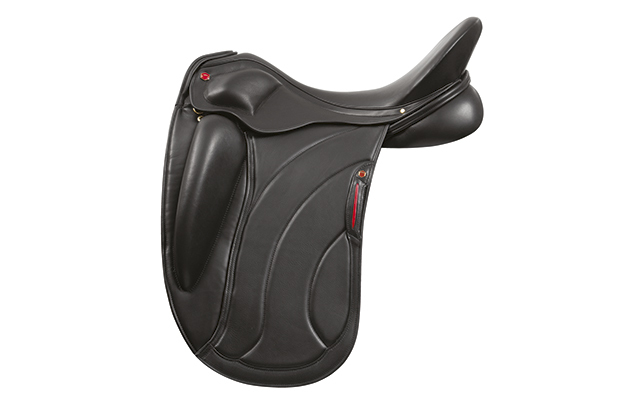 Walsall leather is a proud tradition of saddle-making and leatherwork in the West Midlands. In fact, Walsall has more saddlers and leather goods makers than anywhere else in northern Europe. Charlotte Mackaness visits the heart of England’s hide industry. The Purdey factory has just undergone major renovation. The Field were given exclusive access to the new factory, read The Purdey factory in the 21st century. For a snapshot of social history, football teams’ nicknames can offer a great insight into what has shaped an area. Northampton’s “Cobblers” refers to the town’s shoemaking heritage, while Reading’s side has a long-gone biscuit factory to thank for the moniker “Biscuit Men”. And Walsall FC holds the title of the “Saddlers” because of a tradition of saddle-making and leatherwork. However, this is one association that hasn’t been confined to history. 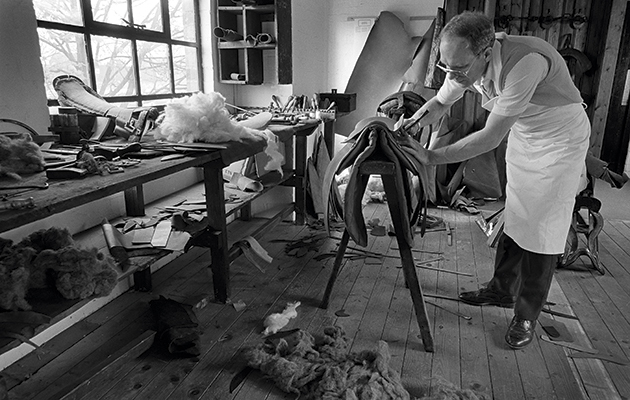 A saddler works in a Walsall workshop. At its peak, around 1900, Walsall leather was home to 6,830 saddle and harness makers. “We speculate that, initially, people were attracted here by the iron in the ground. The metalworking industry that sprang up supplied bits, spurs, stirrups and that sort of thing, so saddles and harnesses were a natural addition,” explains Mills. Compared with the heavy industries that were also booming at the time, saddlery was a relatively “clean” job. Historically, the Walsall leather industry employed women in large numbers because they could do outwork, such as stitching, at home. However, at no time were workers of Walsall leather busier than during the First World War. An experienced saddler cuts leather on his workbench, Walsall. But it is far from doom and gloom for Walsall leather in the Black Country. “Those still in business tend to concentrate on the high end and most are doing well, especially in overseas markets. Many have also diversified into other goods. The Japanese, in particular, have a real fascination with bridle leather. I know of a sumo wrestler who ordered a belt for a 64in waist from one Walsall leather workshop,” says Mills. Sherry Belton, who founded Albion Saddlemakers with her husband Paul in 1985, agrees: “English design, creation and craftsmanship mean a great deal, and appeal to foreign buyers. This country can’t compete in price and volume, so our selling point must be quality,” says Sherry, who is known as “saddle fitter to the stars”, thanks to the number of champions on her client list. 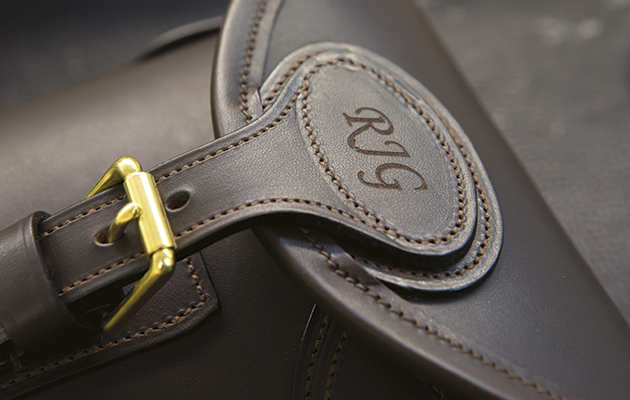 While 21st-century aids, such as marketing and communication, have played their part in Albion establishing itself as one of the world’s most prestigious saddle brands, traditional Walsall leather production values hold the key. Walk through the door of Albion HQ and the senses are hit by a heady whiff of leather and the banging and tapping of tools from rows of skilled craftsmen doing jobs that have, for the most part, remained unchanged for centuries. If one puts aside the contemporary clothes worn, the picture is identical to many of those displayed in the Walsall Leather Museum: hand stitchers still wear “hockles” to protect their fingers, and without doubt a saddlemaker from the 19th-century would recognise all but a few of the tools – although the earphones might be a little baffling. “Music helps drown out the constant noise from the production. Some people bring their own as you’re never going to get 65-odd staff members to agree on what to listen to,” smiles Annie Belton, director and daughter of Sherry and Paul. Music aside, this is very much an old-style workplace, one of long-serving staff and specialised skills where “hot desking” could only ever refer to the hard, physical nature of much of the work. Having in-house tree makers and such a high proportion of hand-stitching and finishing help set Albion apart as part of the Walsall leather industry. “A saddle can last up to 15 years if it is looked after but we have some that come back for repair that nobody in the sales team even recognises they are so old. Quality control – checking and checking again – is a crucial and time-consuming part of what goes on here,” reveals Annie Belton. Customised cartridge bag from Albion Sporting. According to Fin Green, the sporting goods lend themselves perfectly to a bespoke service. “It’s been extremely popular and accounts for half of our orders. Customers love the fact they can put their own mark on pieces. The possibilities really capture the imagination. Recently, we made a bespoke rifle slip for a client fitted to his exact specifications and made in his regimental colours of red and green. “Such clients often visit us here in the factory so they can see and choose the materials. Most are amazed that all our items are individually handmade by real people working at benches and sewing machines.” It also explains why such craftsmanship isn’t cheap. “Our gun slips are fully lined with wool or fleece, they are handstitched and have a block end made with wood, foam, 2mm of plastic and 6mm of leather. They are an investment: built to last and to do the job,” he says. Albion Sporting also produces goods under private label for a number of the world’s most prestigious brands, though it isn’t the only sporting goods maker benefiting from Walsall’s rich heritage of leatherworking. 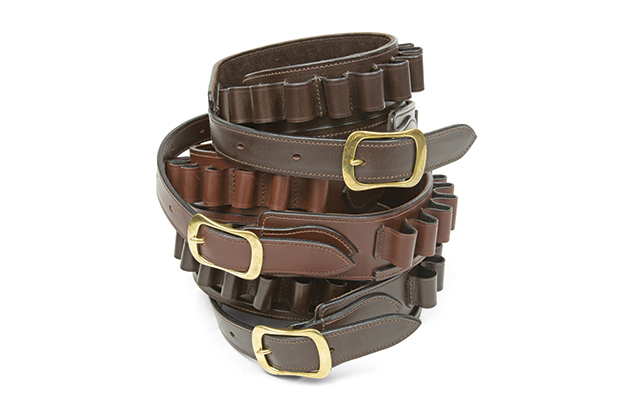 Cartridge belt by Albion Sporting. “We get Walsall leather from a supplier in the town, as well as all our brass fittings,” says Lauren Deslauriers from Birmingham-based Westley Richards. “It is wonderful having the town so nearby. It is a source of such knowledge and expertise; we have a craftswoman from Walsall who does beautiful work for us. 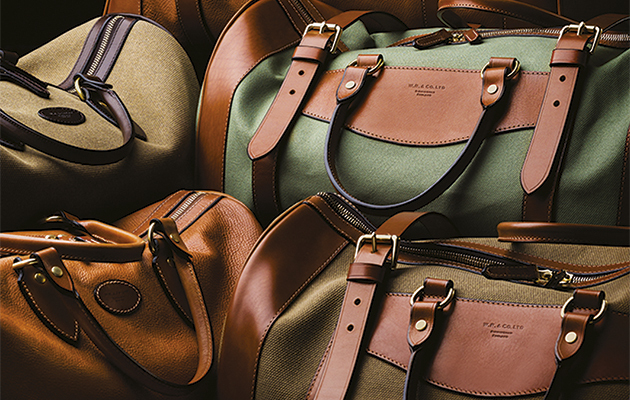 “Our very popular safari bag is made from Walsall leather. We really like using English suppliers and it is all the better when we can pop down the road to see them. The internet is a wonderful thing but nothing beats being able to touch the materials ourselves and seeing Walsall leather in the flesh,” she says. The best craftsmanship on the planet is wasted without top-notch raw materials, and here again many other well-known names turn to Walsall leather. J & E Sedgwick has been a supplier of specialist leather since 1900. “We’re what is known as curriers. We take hides from tanners, who do the mucky bit, and put it through the dressing process,” explains Richard Farrow who runs the company. Cold-climate cows are sought after for their tight grain. “Germany produces fine hides but most go into the automotive trade and we never see them. There’s one tannery in Austria dealing with 70,000 a week just for car upholstery,” he reveals. 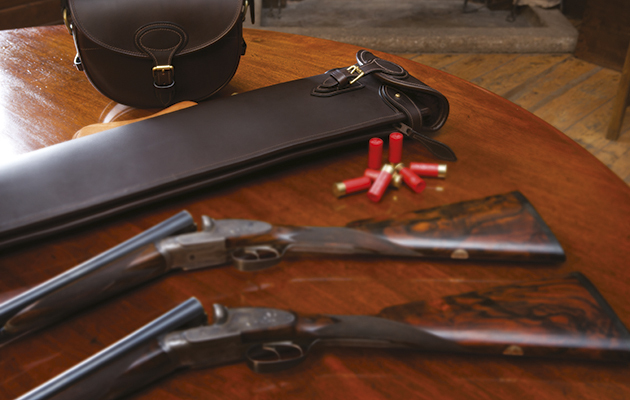 Safari bags from Westley Richards. As with the saddlers, quality controlling at every stage is an important and laborious part of the curriers’ work, which takes over a month.  “When you consider how many weeks’ work and the hours of time that goes into making our leather, you realise it isn’t actually expensive,” Farrow says. Much is still done by hand, although mechanisation has speeded up some processes and made the industry less labour intensive. A rather terrifying-looking machine called the splitter is one example. “The hides have bumps, bits of flesh and veins. This slices them off very thinly. 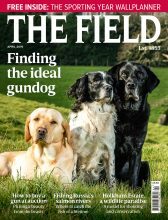 Potentially it is lethal if not operated properly but we can put 60 or 70 hides an hour through it whereas in days gone by it would be a task done by hand with a very sharp knife,” says Farrow. Hides are dyed and treated in four gigantic barrels that whirr away noisily all day like oversized washing machines. “These are automatic but not that long ago they had to be operated manually and going back even further they would have been powered by steam,” explains Farrow. All the hides have to be dried. They are passed through a mangle-like machine and then hung to dry. Much of the 40,000sq ft of the factory is taken up with rows of drying hides. It’s tough physical (and, in areas, smelly) work. An important part of the process is finishing the leather by nourishing it with fat, carefully applied by hand. “It is beef fat and would probably make pretty good gravy,” suggests Farrow with a smile. 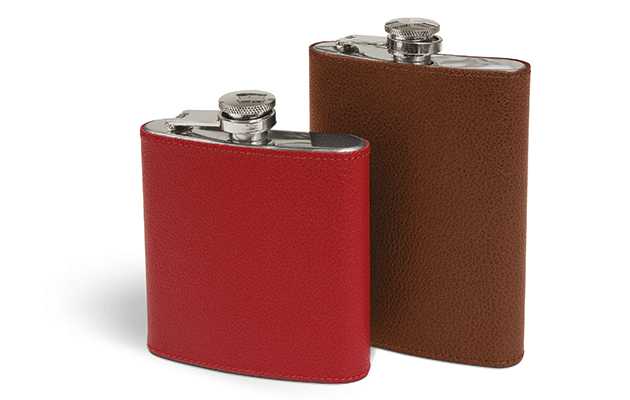 Albion hip-flasks, as part of their luxury leather goods. a visit but let us hope that the time never comes where it is the only place in town to see demonstrations of the finest English craftsmanship.